This SkimStopper product is a luxury leather wallet that has built-in RFID protection which prevents 13.56MHz contactless cards from being read whilst contained in the closed wallet. The introduction of contactless (RFID) technology in mainstream applications such as Oyster cards (London Transport) and credit cards has brought concerns about data security. 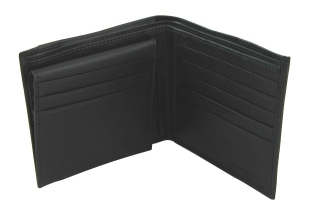 The RFID-Blocking Leather Wallet provides a simple solution to this worry by making it impossible for data to be read, altered or copied, from contactless cards, like such as the Oyster card, operating at 13.56 MHz. SkimStopper wallets are designed to hold UK/European bank notes. Finish: good quality, matt black, genuine leather .